A group of people stand single-file in front of a podium with a microphone on it. Some of the people in line are wearing uniforms. A small figure stands behind the podium. NARRATOR: Welcome, dear reader, to Funnland, the world’s largest amusement park. We join our cast as they wait in line for employee orientation. A young man with ruffled hair stands in line. An odd-looking person with a smile that’s a little too wide stands behind the young man. But we won’t introduce that character with the odd-looking smile until much later. The young man with ruffled hair is wearing a short-sleeved collared uniform, long pants with a stripe down them, and a nametag that reads JASON. JASON: (thinking) Should be a good part-time job. … Hopefully … Maybe … Please? TITLE CARD: Jason King. Our hero. Has no idea what he’s in for. An overweight man with a shaved head stands in front of Jason. The man is wearing glasses, a t-shirt, a pair of shorts, and a nametag that reads SLACKER. TITLE CARD: Slacker. Jason’s friend. Laziest human being alive. A lovely young woman stands in front of Slacker. She’s wearing a t-shirt, jeans, and a nametag that reads RAIN. RAIN: (thinking) What a great day! Reminds of my time at Harvard. And Princeton. And Yale. … OK, maybe three doctorates was a bit much. TITLE CARD: Rain. Jason’s Love Interest. Brilliant, bubbly, and beautiful. A man in a chef’s uniform – complete with the tall, mushroom-shaped hat called a toque -- stands in front of Rain. The man’s clothes seem too large for him. He has a thin mustache and wears a nametag that reads PIERRE. PIERRE: (thinking) If my shipment of sugar and fat does not arrive in time, the salads will be ruined! TITLE CARD: Pierre. World-famous chef. Enemy of dieters. An old man with a furious expression stands in front of Pierre. He’s raised his hand as if to ask a question. He is bald save two wisps of hair that stick out from the back of his head. He’s wearing suspenders, glasses and a nametag that reads ARTHUR. ARTHU: (furious) Hey Gorgon! I got a question. Why I am I in line? This is my dang park. TITLE CARD: Arthur Funn. Park Founder. Now an employee. Bitter old man. A man in a tie and business suit turns around and faces Arthur. The man looks every bit the dashing executive, except that he has the face of a hideous lizard monster: huge sharp teeth, a pointed head and reptilian skin. He has no nametag. He is MR. GORGON. MR GORGON: (furious) Not any more. Wait. Who said you could complain? Or even talk for that matter? TITLE CARD: Mr. Gorgon. Funnland CEO. Evil. A square-shaped man stands behind the podium facing the people in line. He has a world-weary expression on his face.If you piled a bunch of cubes on top of each other and made them wear a bland uniform and a nametag with no words on it, you’d have this person. For now, we’ll call him NAME UNKNOWN. TITLE CARD: Name Unknown. Ride Operator. Empty Human Shell. A close up of Mr. Gorgon, who has turned back around to face Name Unknown. MR. GORGON: And you! Square-shaped thing! Drone louder! Louder! We’ve pulled back from the line so that people are just tiny figures. NAME UNKNOWN: Welcome to … Funnland. 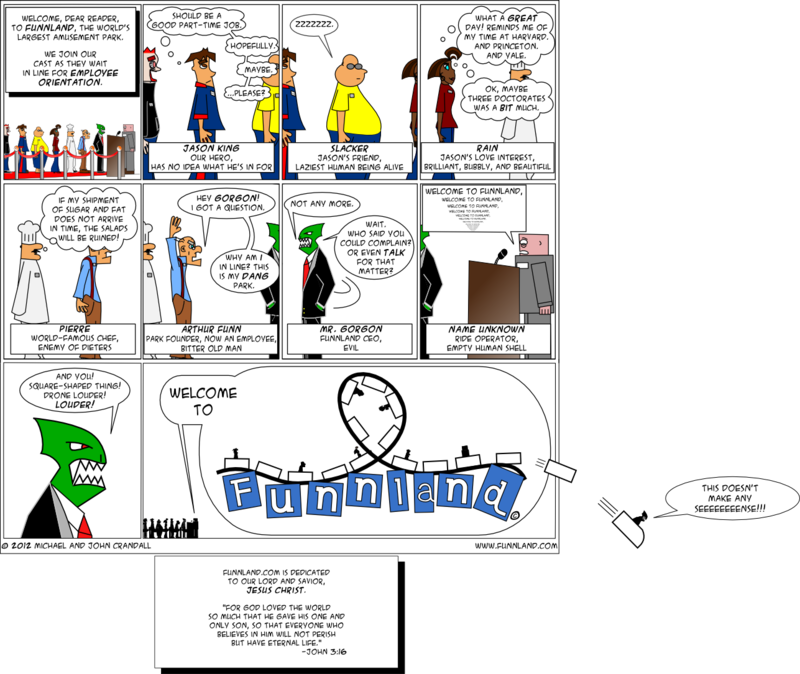 Inside his speech bubble, the word “Funnland” is huge and made up of haphazardly-placed letters. A roller coaster with a large loop-the-loop sits above the word. The word and the coaster are the logo of the comic. A number of rollercoasters cars sit on the track and about half of them hold tiny version of the characters. The two cars farthest to the right are falling off the rollercoaster at a high rate of speed. A tiny Mr. Gorgon sits in the rightmost car. He yells as he plummet out of the frame. TINY MR. GORGON: This doesn’t make any seeeense!!!! So jazzed! Keep ‘em coming! I love Pierre “enemy of dieters” !! !